Every year I seem to do a post about Oxalis, the floral form of potted Irish Shamrocks, it is only because I enjoy Oxalis so much that I do a traditional post. I annually contact one of Home Depot’s amazing, dependable, plant providers by mid-February and ask if they will be shipping in any Oxalis this year, and when they respond with a “yes” I almost do a little jig! 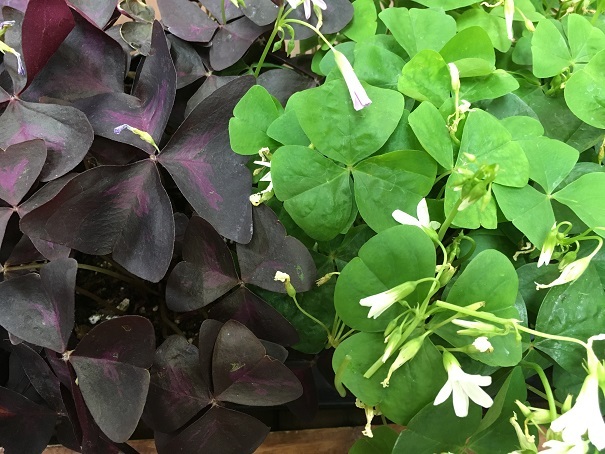 Oxalis makes a wonderful houseplant; unfortunately, it is most typically only available for sale for a few short weeks in March. Oxalis appears for a quick glimpse and then it disappears, much like a leprechaun! I have been growing an (a purple shamrock) Oxalis for years. The wee pot keeps me entertained; for weeks at a time the plant will perform at its best shooting up small, pale, purple flowers above its beautiful, flat, aubergine, triple leaf, foliage. The leaves spread wide open during the light of the day and close upon themselves in the evenings, the closed leaves look like sleeping butterflies, they are so pretty….. and the next morning they spread open again! I have never seen a plant turn toward the sun like an Oxalis, its leaves turn and react to light you can almost see it move, Oxalis are a bit magical if you ask me. Oxalis are tiny bulbs that are packed with power, they are unstoppable with just a little care: Do not over water them, well-drained soil, keep them on the cooler side and show them the early morning sun and the afternoon shade, rotate the pot so that the plant grows evenly. 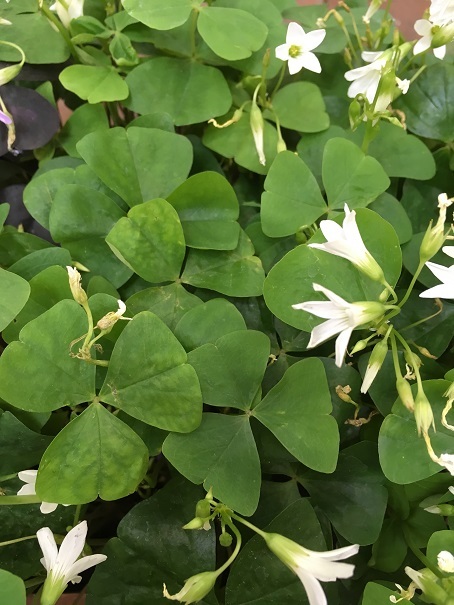 Just a bit of magic in a wee pot, treat yourself to an oxalis and become enchanted, stop by your local Home Depot and see if you can find the three leaf wonder before they disappear! 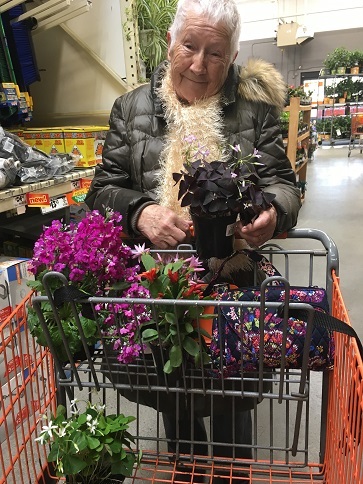 This lovely woman was so happy to find a few pots of oxalis for her St. Patrick’s Day celebration; she is making corned beef and cabbage for forty guests and the oxalis will be the “perfect touch” for her festive table she said.